The Fellowship was fortunate enough to obtain a copy of COMEBACK #1 from Image Comics. Ed Brisson writes, and Michael Walsh draws. Mark and Seth have an interesting job; they go back in time to save people’s lives. This is obviously not a cheap service that their company provides, and sometimes they have to fake things like car accidents. But now Seth is starting to burn out, and is ready to retire. And something else is going on; another ‘agent’ has an agenda of his own. This is an interesting concept. I’m not normally into time travel stories, but this one works. It’s not overly dependent on the time travel trope; it presents certain side effects, but otherwise this story could be associated with any ‘secret ops’ type of setting. Mark and Seth will likely be the ones to solve the problem, but it’s still not clear if the time travel aspect will have much to do with the solution. And that uncertainty makes it a cool story. This issue does a really nice job of setting up characters. Good characters, good story, good concept. This one’s got the whole package; it will be fun to keep up with this story. 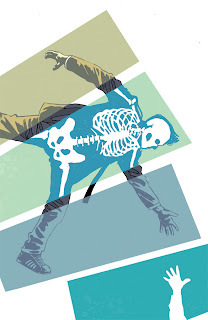 COMEBACK #1 is available now at your FLCS or by order from imagecomics.com.